Equipped with a 300mm steel bar and powered by rechargeable 40v lithium ion batteries (not included), the G40CS30 offers powerful and portable sawing performance without the inconveniences commonly encountered when using petrol alternatives. A low maintenance machine, the G40CS30's battery powered operation means there is no need to worry about taking trips to buy fuel, mixing it and storing it - the chainsaw can be stored and transported safely, and can be used with lower lifetime costs and less environmental impact. 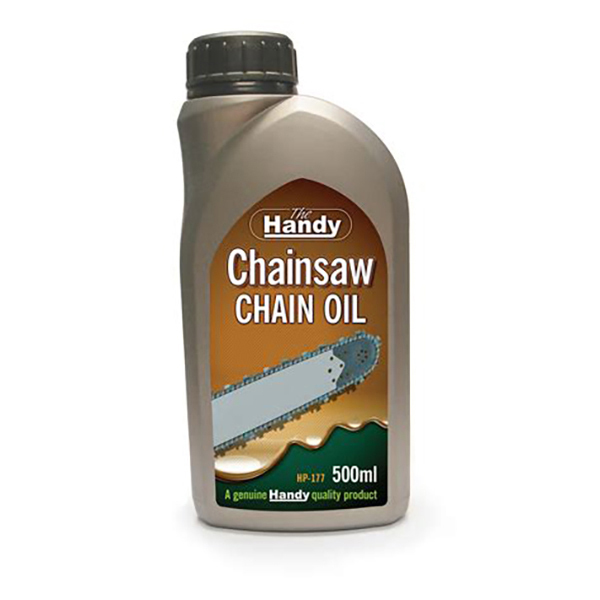 The G40CS30's auto-oiling system delivers the necessary lubrication to keep your chainsaw running smoothly and efficiently. Adjusting the chain tension, replacing the chain or cleaning the sprockets, can all be simply accomplished with the G40CS30's tool-less chain tensioning system. As well as convenience and ease of use, the G40CS30 delivers a high level of protection to the operator. Cushion over-moulded grips provide a comfortable and secure hold that minimizes fatigue and ensures a controlled grip on the tool while a large front guard provides a reassuring shield between the operator and cutting area. A two button safety start helps to prevent accidental start ups, and the included 10mm pitch chain delivers solid cutting performance with less kickback, helping to ensure maximum control during use. Robust 30cm (12in) steel bar and chain with tool-less chain tensioning offers ease of use while delivering the highest cutting performance. 10mm (3/8') chain pitch delivers the capabilities for trimming and cutting with minimal kickback and the two-button safety start helps prevent accidental start ups. 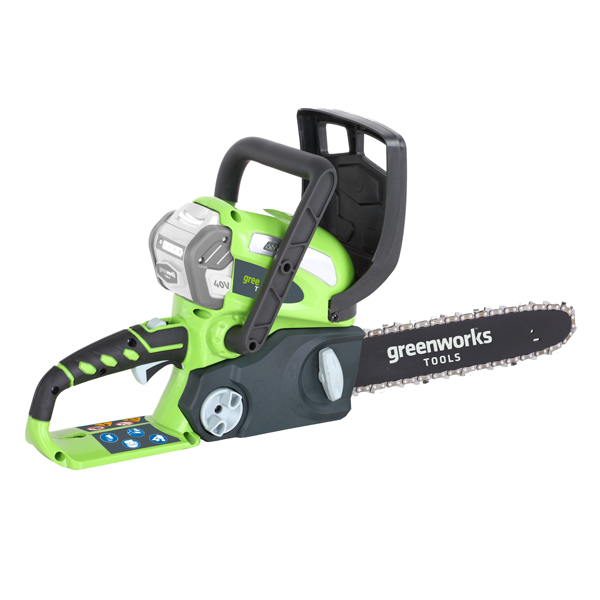 This chainsaw is designed for cutting branches, trunks, logs and beams of a diameter determined by the guide bar. 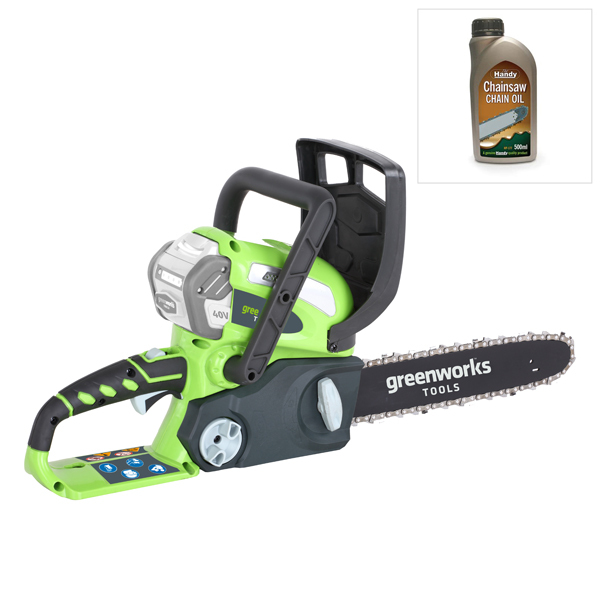 It is designed to cut ONLY wood. It is not to be used by children or persons not wearing adequate PPE or clothing. Note: You must be over 18 years of age to purchase this product.